Can video games teach you to be a better photographer? Woe to the medical student who plays Surgeon Simulator instead of studying and goes on to be sued for gross malpractice after accidentally sawing open a patient’s lungs. Rest in peace to the aspiring skater who, emboldened by Rob Dyrdek’s proclamation that playing Skate is equivalent to learning how to skateboard, jumps on a board for the first time and tragically breaks their spine in 11 places. As far back as the ’80s, edutainment titles like Where In The World Is Carmen Sandiego? and Oregon Trail were teaching kids geography and history, and now forward-looking schools are beginning to use games like Minecraft to teach soft skills such as curiosity and communication. But we don’t often hear about games being used to teach technical skills or trades. Maybe that’s for a reason. If your house was burning down, would you trust a firefighter whose only training came from playing Super Mario Sunshine? In January, I bought my very first camera, and if I’m being honest, it was a purchase partly inspired by my bottomless fondness for photography mini-games. It makes sense that photography would be a natural fit for video games. Over the last several console generations, controllers have been evolving to better accommodate first-person shooters: their twin joysticks enabling simultaneous movement and aiming and their shoulder buttons deliberately evoking triggers. Shooting a camera and shooting a gun—mechanically speaking—they’re not so different. If games’ fixation on pointing and shooting was in service of more naturalistic gunplay, was it possible that their depiction of photography has been equally well served? Games had brought me to photography, but had they actually taught me anything useful about it? Could this be a case study in games’ ability to teach concrete skills? I’m too green to tell, so I enlisted an expert. Felix Russo is the editor and publisher of PhotoEd magazine, and he taught photography at George Brown College in Toronto for 13 years. It was there that he gave me the only formal photography training I’ve ever received—everything I know about photography, I learned either from him or from video games. If ever I had a question about learning how to take a great photograph, he’s the man I’d want to ask. I got in contact with Felix to have him weigh in, as both a teacher and a photographer, on what, if anything, players could learn about the art and craft of taking pictures by playing four games in which photography plays a prominent role. Pokémon Snap depicts a nightmare scenario: a world in which the artistic merit of your work is judged by a scientist. The player is a wildlife photographer visiting an island of absurd geographical diversity to collect photos of wild Pokémon. After every level, you return to the lab of Professor Oak, who offers you a score and constructive criticism on any photographs you opt to show him. Oak’s tastes are utilitarian. He assigns a high value to shots in which the subject is centered, fills the frame, appears with other specimens—that sort of stuff. What Oak especially values in a shot is novelty. He’ll hand out huge bonuses for photographs depicting subjects engaging in interesting or unusual behavior, and earning the highest possible score requires seeking out these rare shots. Is novelty as important to a photograph as Professor Oak believes it is? Potentially, says Felix, but the fundamentals of a good shot always come first. Pokémon Snap’s scoring system seems to support this. While you earn a flat point bonus for capturing rare or strange activity, your reward for ensuring your subject is centered in the frame is to have your score outright doubled. In other words, an expertly taken photograph of a Pidgey should be more valuable than a crummy picture of the legendary Articuno. One more important lesson to take away from Pokémon Snap: Sometimes those novel shots need a little encouragement to happen. Professor Oak will offer you 1,000 points right off the bat for a picture of a Pikachu on a surfboard, but the only way to get that shot is to lure the critter onto the board with food. That’s fair game, says Felix. There is some gray area about how much manipulation is too much. Felix invoked National Geographic’s infamous manipulation of Gordon Gahan’s shot of the Pyramids Of Giza as an example of what not to do. “But at the end of the day,” he insists, “the photograph stands on its own.” If that surfing Pikachu makes for a great shot, maybe it doesn’t matter how it got there. 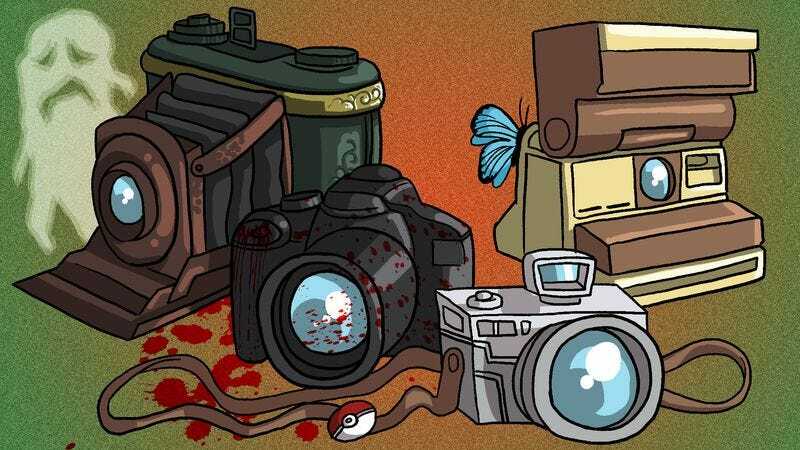 In the Fatal Frame series cameras aren’t tools; they’re weapons. The Camera Obscura, modeled off old daguerreotype cameras, is used throughout the series to combat angry ghosts. Fighting lost souls in Fatal Frame is as easy as lining them up in your viewfinder and snapping photos, but you can increase the amount of damage your shots deal by keeping ghouls in frame to build up your shot’s “mystical power.” To really bust some ghosts, you’ll want to seek out rare Shutterbug Moments, brief instants during spirits’ attacks where they’re susceptible to critical hits. These moments are fleeting and challenging to find, but the rewards for seizing on them are immense. The stakes may not be as high as they are in Fatal Frame, but catching these moments is just as important to your shot and the window of opportunity is just as small. If you miss a Shutterbug Moment, you’ll still damage your target, just not as much. Likewise, miss your decisive moment and you may end up with an okay picture, but that ephemeral perfect composition will be lost forever. If these moments are so important to getting a great photograph and/or defeating angry poltergeists, how does one go about finding them? In both Fatal Frame and real life the answer is the same: a combination of practice and intuition. “We have a concept we use in photography called ‘pre-conceiving’ the image,” Felix said, expounding on an idea popularized by landscape photographer Ansel Adams. The trick is to know what you’re looking for before it’s even there for you to see, whether you’re searching for a vulnerability in an enemy’s attack pattern or a perfectly composed photograph. The most concrete piece of photography advice in Life Is Strange comes, appropriately, from a photography teacher: “Always take the shot.” That’s easy for him to say; he shoots on digital while the character receiving his advice shoots with pricey instant film. Still, his advice is perfect within the context of the game. Taking a photograph in Life Is Strange entails putting main character Max Caulfield in the right place at the right time, at which point you’ll be given the opportunity to snap a shot. Because they’re all predetermined, you’re not given the option to take bad photos. Max’s snaps will always be technically and compositionally flawless. It’s the game’s way of putting players in the role of a character whose skill with a camera is admired or envied by everyone she meets, but this system also posits that the most important part of photography is knowing what and when to shoot. Although the challenges of shooting film aren’t addressed in Life Is Strange, following in Max’s footsteps and eschewing digital photography is a potentially enriching trial by fire. Shooting a finite roll of film means you don’t have unlimited mulligans to get a shot right, so you’re forced to either learn the craft or throw money away on ruined photos. Dead Rising’s Frank West isn’t an artist, he’s a journalist. He isn’t trying to creatively express himself with his photographs; he’s trying to turn heads, keep people’s attention, and stay in shoe leather while he’s at it. In Dead Rising, photography is a practical pursuit with simple goals and concrete rewards. A picture is considered good if there is a lot of stuff happening in it—the gorier, scarier, and sexier the better—and good photographs reward Frank with “prestige points.” Collect enough prestige points and Frank levels up, becoming permanently heartier and learning new combat techniques. It’s a mercenary depiction of photography, but Frank is a mercenary guy, a gun-for-hire with a camera instead of a weapon. It’s a fair point, and it also cuts right to the heart of the question of games’ viability as teaching tools. Simulations of photography can impart important lessons about how to approach the craft or about what hypothetically constitutes a good shot. They can demonstrate with bonus points the value of choosing an interesting subject or finding the decisive moment by elevating it to a matter of life and death. But the best way to learn a practical skill is always going to be actually practicing it. Simulations are not substitutes for actual experience. If games are going to have an expanded role in the future of education, it should be as interactive textbooks—purveyors of wisdom and advice that can provide guidance and structure for practice but never replace it. Just as you wouldn’t trust a cab driver with a Crazy Taxi high score but no license, your 8,000 point Pikachu photo alone won’t make you the next Edward Weston.